Here’s a fun way to use your beet greens—add them to a red beet smoothie! This smoothie is an energy booster. 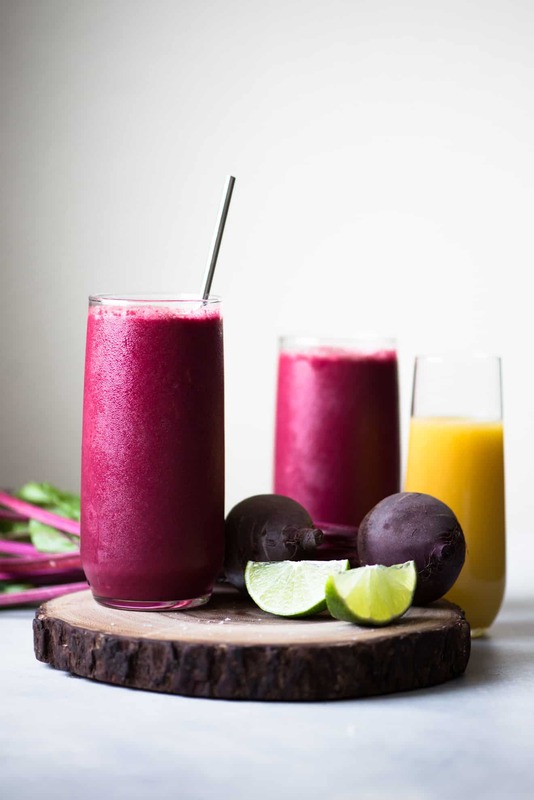 It’s filled with beets, beet greens, orange juice, frozen fruits and a touch of spice! I love cooking with beet greens. If you have never had them before, they look and taste a lot like swiss chard, except the leaves are smaller and the stems are thinner. Like the actual beet, the stems release a lot of red color when you cook with it! I often toss the stems with rice, and I like to think of it as beautifying the entire dish. I am currently on a mission to find more ways to cook with beet greens. Whenever I go to the farmers market, I mill around, collecting beet greens that other customers ask to be chopped off. I can’t bear to see good food go to waste! Beet greens are also packed with Vitamin A (good for vision, immunity, etc.) and Vitamin K (good for healthy bones and important for blood clotting). An easy and tasty way to use your beet greens is to add them your smoothies! I usually only use the leafy parts, saving the stems for sautéing. If you are using a high-speed blender, I don’t see why you can’t toss a few stems into your smoothies, too! Just be sure to slice them into smaller segments first so that they’re easier to blend. When you buy beet greens at the farmers market (and sometimes at your grocery stores), there’s usually a lot of dirt on the leaves and stems. I always rinse them several times before cooking with them. If you’re not cooking the beet greens within a day or two of purchase, chop off the beets and separate the stems from the leaves. Refrigerate the beets in a plastic bag—they usually keep for a few weeks. Rinse the stems and scrub out any dirt. Pat them dry and slice them in half so that they’re easier to store. Rinse the leaves thoroughly. If you have a salad spinner, use it to get rid of some of the moisture from the leaves. You can also pat them dry and let the leaves air dry on a baking sheet that’s lined with towels. I leave them out for 30 minutes to an hour. Store the leaves and stems together in a plastic bag. They usually keep for about a 1 week (sometimes even a few days more) before the leaves start to brown. Using red onion: A lot of you might be wondering why on earth I’m adding red onion into a smoothie. It makes the smoothie taste more interesting! I usually add 1 or 2 thin slivers of red onion into smoothies, which is about 1/2 to 1 teaspoon of minced red onion. If you’re a bit apprehensive about this (and I totally get it), start out with 1/2 teaspoon of minced red onion first and work your way up if you’re feeling more adventurous. I tried a version with 2 teaspoons of minced red onion and that was way too much! I had a bit of onion breath after drinking the smoothie, which wasn’t exactly the sensation I was hoping for . . . Boosters: If you are looking for a bit more natural protein in the smoothie, add a few tablespoons of raw almonds and/or a generous pinch of hemp seeds. You can add more almonds and hemp seeds, but do note that they tend to water down the flavor of the smoothie. WANT MORE SMOOTHIES + DETOX DRINKS? I know that the ingredients list for this smoothie is a bit long, but they all add to the complexity of the flavors. You can pare it down by only using frozen mango or frozen strawberries for the smoothie. Just be sure to use two cups instead of one. Add all of the smoothie ingredients to a blender and blend until smooth. Pour the smoothie into 2 large glasses. Enjoy! SUBSTITUTIONS: (1) If you don’t have been greens, you can substitute it with baby spinach. (2) If you have fresh ginger, consider adding 3 to 4 slices of them to the smoothie! Yea!! It adds a very interesting flavor! Beet greens are my favorite part of the beet! My mother always planted a large patch of beets and we just kept cutting off the greens and eating them all summer. They will continue to regrow all summer long and stay tender. We ate the beets in the fall after the first frost because it sweetened them up. Love, Love Beet Greens! These are stunning. I love beets and have been using them a lot recently. Unfortunately, I can’t buy them fresh enough to still have the greens here in Malaysia! i do love them when I’m in the States though. Thanks, Michelle! The other day, I added daikon greens into my smoothies and it tasted fine! I didn’t add too much though because I was afraid it might be too peppery. Maybe that’s worth trying some time? I think you should be able to find a lot of daikon in Malaysia with the greens still on there, right? I’m so glad I found your website and article. I have never used beet greens in anything. I can’t wait to try this recipe and with the onion too, this is defiantly very nutritious. I am always on look out for new smoothie and juicing recipes to try and share. Thanks!! Thanks, Sasha! I hope you enjoy it! 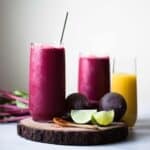 I am going to try the beet smoothie TODAY. I usually juiced the beets. In regards to the beet greens….I washed them thoroughly, cut them up, and place them in a freezer baggie and freeze them to be used in my smoothie. Is the beet greens red stem good for you…. if so, how can I use them. Thank you for your feedback. I just love your blog and your recipes. Looking forward to trying a lot more recipes. Hi! I am very interested in this recipe, however I am allergic to nuts and I was wondering what you thought would be the best to use in place of the almond milk in your smoothie recipes. Hi Charis, if you are not allergic to soy milk, I would try that first. Otherwise, filtered water works, too. Can’t wait to try this recipe! If you are looking at different ways to use up beet leaves, I love using them in Somma Borsht. Put everything except the potatoes in a large pot. Fill the pot with water till everything is covered. Simmer on the stove till the broth is is no longer red. Add potatoes, simmer for at least 30 mins. Add salt to taste. (Potatoes will turn pink if you add them too early) Like most Borshts, this will become more flavorful the longer you simmer. I usually add a dollop of sour cream in the bowl before serving.